Have you ever use dos command using your PC? Here are some basic list of command that you must know. ipconfig - Windows IP Configuration ipconfig will tell you the IP settings for the current computer such as what your current IP is and what subnet/gateway you are on. It is great for troubleshooting. 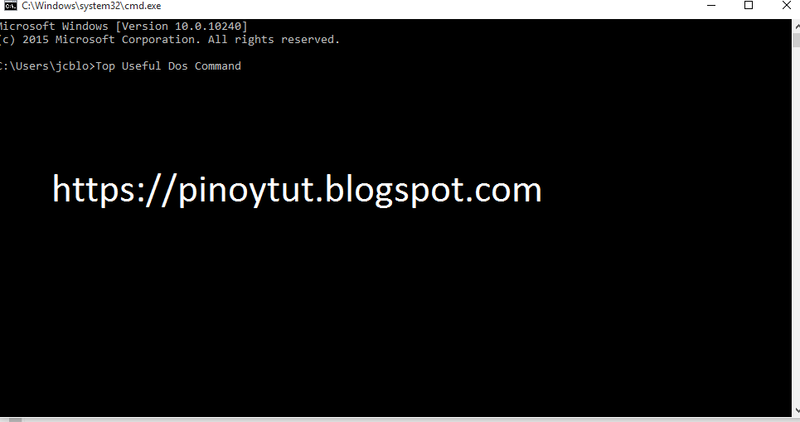 ipconfig /all – Views detailed information about the installed network devices. ipconfig /renew - This will ask any DHCP servers (usually your modem/router) for a new IP address. ping - Check a connection or computer Ping is used to check the health of a connection. The ping command will tell you whether a network device is responding and how fast it is running. The ping tool can also be used to convert a web address into an IP (eg. www.google.com = 74.125.19.99). ping www.google.com - Pings a webserver to see if it can be reached or is responding. I personally use this to see if the computer I am on can reach the internet. ping 192.168.0.1 - Pings a local address, often a modem, router or another computer. netstat - Displays current TCP/IP connections netstat - Will display what connections are currently active on the system. Useful for spotting programs calling back to base such as spyware. For more options with this command, type attrib /? dir c:\ /s /b | find ".pdf"
For more information in this command and its usage, type find /? systeminfo - Displays information about the system systeminfo - Will display information about the system such as the name, version, uptime, specifications and patches installed (XP Pro only by default). tasklist / taskkill - Shows what programs are running on the computer and can kill them tasklist - Will display all the processes running and their memory usage. sfc - Launches Windows’ system file checker utility sfc /scannow - This command will start scanning your computer for any damaged or missing windows system files. Useful to run after a virus, adware or spyware attack has damaged core files. Have an XP CD handy for this one. chkdsk - Can check a disk and attempt to recover data in bad sectors. chkdsk /f /r - This will check a disk for errors and try and fixes information from bad sectors chkdsk /x - Forces the volume to dismount first. For further information/usage on any of these commands, you can bring up the help for each one of them by typing: command /?